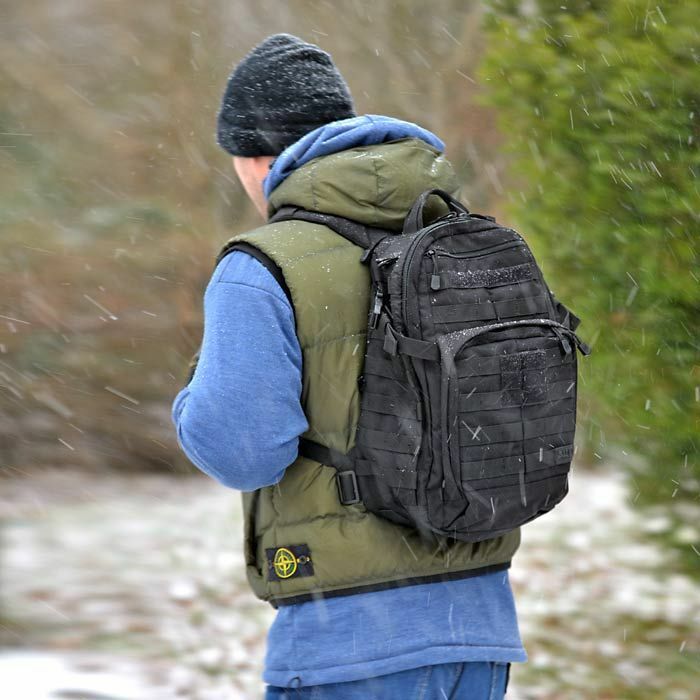 The 5.11 Tactical Rush 12 Backpack is a water-resistant rucksack with more than 20 litres of packing space. Featuring a wide range of useful pockets and compartments, it makes an ideal day pack for those of you who like to keep your kit protected and organised when on the go. With a 21.2 litre capacity and weighing in at 1250 g, the Rush 12 Backpack is perfect for daily commutes and short business trips, thanks in part to a protective laptop sleeve within the main compartment. A wide-opening admin pocket on the front of the pack features sleeves for pens, business cards, a camera, GPS unit, keys and much more, while two inner mesh pockets provide further space for computer accessories, personal electronics, and other small items that you want readily accessible. The 20 x 12 cm zippered compartment above the admin pocket is useful for storing your radio, phone, travel documents, snacks, and other small items, while a fleece-lined pocket at the top of the pack provides safe storage for eyewear. Two compression straps keep everything snugged closer to your body for comfortable load management. The Rush 12 is also the perfect size for hand luggage when travelling by plane. 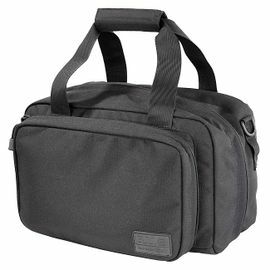 As with all 5.11 products though, this bag is of course more than tough enough to handle the demands of outdoor use too. Constructed from water-resistant 1050-denier nylon, the Rush 12 was designed with the help of US Special Operations combat veteran Kyle Lamb, and has truly been created with the end user in mind. The back panel features a reinforced hydration pocket that will accommodate bladders of up to 1.7 litres in volume, while concealed hydration tube ports are situated either side of a heavy-duty grab handle. Extra padding on the back panel promotes ventilation while the anti-skid pads help to keep the pack in place when you’re moving. The shoulder straps are padded and contoured for extra comfort, and feature a sternum strap which can be adjusted to four different heights. Tri-glide fasteners are included at the bottom of the pack allowing you to add a waist belt (not included), while two grommets in the bottom panel provide air flow to the main compartment and allow water and debris to escape. Self-repairing YKK nylon coil zippers are used throughout, and the high-impact buckles, tri-glide fasteners and other components are not affected by differences in climate. All metal grommets and zip sliders have been coated to match the colour of the pack and increase their resistance to corrosion. The entire pack features numerous web platform points, allowing you to attach a host of 5.11 SlickStick accessories if you wish (compatible with standard molle attachment systems). The features, materials, and design of the Rush 12 Backpack make it a superior value day pack fit for rugged use. 5.11 Tactical packs are currently in use by Law Enforcement, First Responder, and Military units and other demanding professionals around the world. 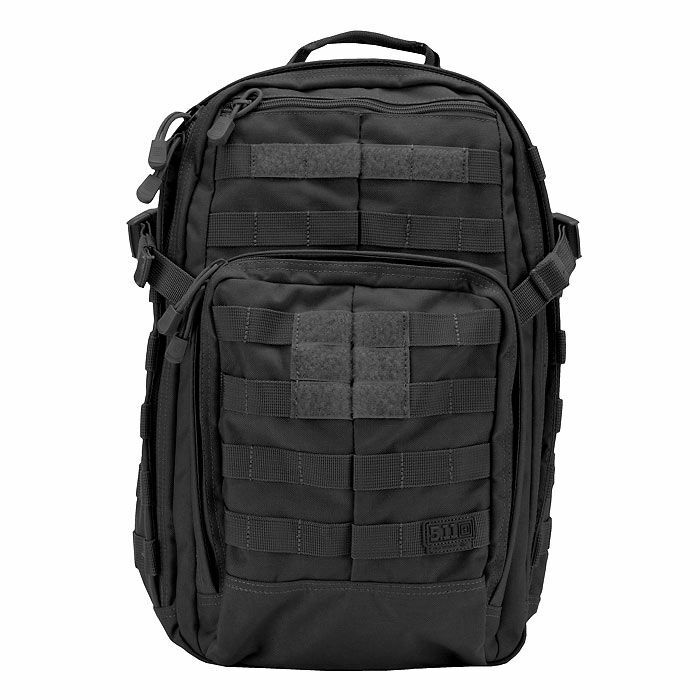 5.11 Tactical Rush 12 Backpack - Black is rated 5/5 based on 7 customer reviews. Okay so it cost £80 but worth every penny. This really is a quality item you, know the saying buy cheap pay twice, GO RAY. Well made kit, functional organisation at home in the city or the country. Resists rain well and Molle compatibility is good. Body shape makes for a “big” 24 litres compared to some previous packs. The multiple compartments and internal organiser pockets really useful. The wider shoulder straps can rub under the arms of you don’t adjust properly, the chest strap useful when carrying heavier loads. For this size pack a waist strap is not required. An absolutely brilliant pack and much better than I expected. 5.11 definitely make quality products. Highly recommended to anyone looking for an excellent quality pack that will last for years. If you're good at packing your pack, this can easily be used as a 24h pack. I've only used this once so far, but it has been noticeably lighter and more comfortable than any rucksack I've had before. It made carrying stuff feel like a breeze. I first saw the 5.11 Tactical Rush 12 Backpack some months ago while sitting on my Mac looking at some guys walking in Scotland. I was immediately impressed by the reviews and everyone was talking about the high quality. I spent the next few weeks reading review after review and finally took the plunge and ordered one from Woodlore. Well, today my new 5.11 Tactical Rush 12 Backpack arrived. The quality is fantastic; it's even better than I imagined it could be. Straight away I knew when I was taking it out of its packaging I had something special; there is not a single negative I can say, it is just fantastic. The service from Woodlore is second to none; one day all websites will be this professional. Thanks a lot guys look forward to spending with you again. Brilliant. Bought for dual purposes... cabin baggage for a trip to New Zealand and as a day-to-day bag. Have now tried it out for a week and also had a trial pack for my trip. Excellent for both purposes. I also do Scouts and it will be great for weekends at camp, days out and hikes etc. The quality is first rate and I can see it lasting for several years. 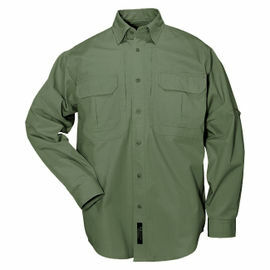 For the capacity, sturdy fabric and number of organisation pockets the light weight is incredible. I'd recommend it to anyone. Also very swift and efficient service. Thank you. This is a fantastic load carrying product! It has superb organisation pockets, and is made of the best quality materials, and I'm sure it will last a lifetime! My only complaint is it's heavy, but the carry straps spread the weight very well!